originally posted August 2014, updated November 2014. I am a big fan of knitting/fibery podcasts. They keep me company during walks and bed rest, while I am creating and cooking and cleaning. And the great thing about podcasts is that they allow me to interact with the hosts in a way I can't easily do with other mediums like TV or Books! I have made some very good friends because of podcasts. I have a special fondness for podcasts with a geeky flare. I enjoy hearing about podcasters who are also designers talking about their newest patterns. Many podcasts, I have to listen or watch with my browser window at the ready to add things to my ravelry queue! do note, URLs may change, and I will attempt to keep the links updated. The Knitmore Girls hosted by Jasmin cuteknitter and Gigi gigidahling "a multigenerational knitting production." find them online as @knitmoregirls and @knitmoregirls. knitting butterflies hosted by Emily emilystraw "fiber, photography, and life" find her online as butterflyem4 and her group. Geeky note: I listen to my podcasts in Downcast, on both my devices and my Mac. I can sync the list of subscribed podcasts and then only download the ones I want to each device (usually audio to my iPhone, and then streaming for video on either the Mac or iPad). 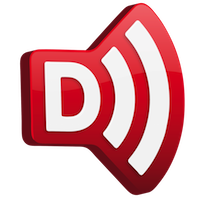 Downcast uses the same updates as iTunes, so if you are using iTunes to listen to podcasts, Downcast is a similar alternative. It doesn't require podcasters to do anything different when publishing! I listen on the go with my iPhone, while crafting in my craft office (where I podcast from) on the big monitor hooked to my laptop, and in the evening in bed or from the kitchen while I cook on my iPad. I used to just use my iPhone but it sure is nice to have everything using the same list for any device I choose at the time!